According to Canalys's data, Apple shipped 3.9 million units of the Apple Watch in the third quarter of 2017, giving it a 23 percent market share. Out of the 3.9 million shipped units, the standalone Apple Watch Series 3 GPS + Cellular model contributed approximately 800,000 units to Apple's total. Apple does not provide sales figures for its wearable devices, but did reveal doing its Q4 results call that its wearable business, including Apple Watch, AirPods, and Beats products, was up 75 percent year-over-year for the quarter, making it the size of a Fortune 400 company. For the Apple Watch specifically, CEO Tim Cook did note Apple Watch sales were up 50 percent compared to the June quarter, declaring it to be the world's best-selling wearable device. 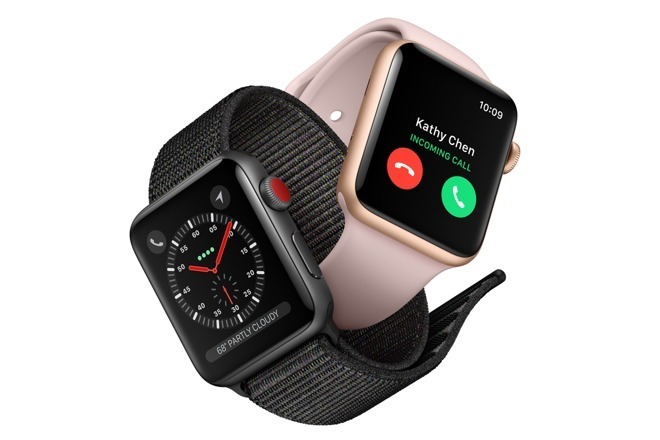 "Strong demand for the LTE-enabled Apple Watch Series 3 has dispelled service providers' doubts about the cellular smartwatch not appealing to customers," said Canalys analyst Jason Low. The Apple Watch Series 3 apparently did not reach its full potential in the quarter, with Low suggesting it suffered "limited availability" as demand outstripped supply in some major markets, with some service providers apparently underestimating demand for the new model. "In China, customers with high expectations are being driven away by the service disruption fiasco in the country," advises Low, warning operators they should work on "improving their remote service provisioning systems to cater for the expected higher demand in Q4." Closest rival Xiaomi and third-place Fitbit followed behind with 3.6 million and 3.5 million shipments respectively, with the three firms reportedly beating the trend of a weaker third quarter by posting quarter-on-quarter growth. Huawei landed in fourth place in the rankings with 6 percent, while Samsung took fifth position with 5 percent of the market. 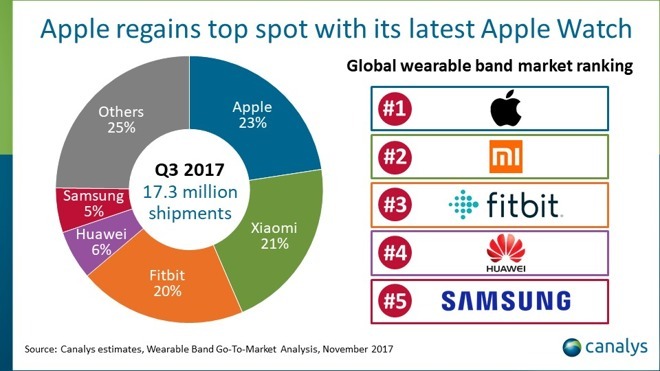 While Apple, Xiaomi, and Fitbit all increased their shipments, the waning demand for other bands of wearable devices is said to have caused some shrinkage in the market, dropping two percent to 17.3 million shipments in the quarter. Research analyst Mo Jia notes that smartwatch producers like Apple continue to increase the value of their products "by prioritizing design and highlighting key features," while health continues to be a core focus. Highlighting Apple and Samsung's approach to brand loyalty by creating an ecosystem of devices and services, Jia also advises "smartphone vendors must reevaluate their respective smartwatch strategies to derive more value" beyond increasing smartphone sales. The fourth quarter is expected to be stronger this year compared to 2016, with improvements to health tracking functions, longer battery life, and better designs across the market likely to boost sales. The quarter is also expected to be a barometer of consumer reactions to a new trend of fashion-focused smartwatches that prioritize the design over the functionality. As for the Android Wear ecosystem, the Apple Watch's main competition, Low suggests "Google must show stronger commitment to help Android Wear vendors, which are now mostly watchmakers and fashion brands, to further improve the user experience and app ecosystem." If Google fails to do so, Low warns the market "will see further consolidation" with Apple, Samsung, and Fitbit dominating the market.